No, I don't think that would fix it. I'd pull the second router and eliminate that as an issue. 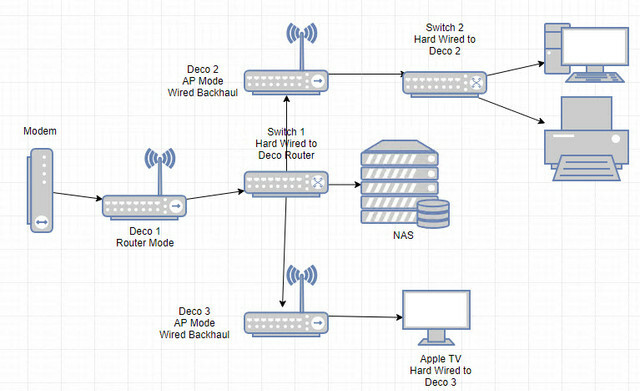 Having 2 misconfigured routers on the same network is going to cause problems. Start as simple as you can, Hitron-router. Bypass the switch and plug any ONE of your upstairs cables directly into the router. Go upstairs and see if that port works. Just had a thought...if you plug a network cable into a switch, and it loops somewhere else...say someone has plugged a cable from one port into another that can reek havoc. Or someone pounded a nail through a wire and is causing a short, or wired a port incorrectly. A surefire sign of this is all the lights flashing away on the switch, in snyc with each other. So as suggested, bypassing the switch should solve that. If you can make the simple network work, unplug everything from the switch, and re-connect one at a time. You should be able to pin down where the issue is. If you can't make the basic setup work, try new network cables. Nope, it wasn't a loop. Of all the things I have thought of and tested, it was something insanely simple and stupid. I realized there was an important ethernet cable that wasn't plugged in... I must have disconnected it to test something or replace the cable and forgot to plug it back in + assumed it was plugged in. I'm not understanding why you have two routers on the same network. One should be a router and one should be access point mode, should it not? If multiple AmpliFi HD routers are on the same AmpliFi HD mesh network, the secondary routers are then automatically set as access points. For $30 more, I chose to grab more routers than pay for the sword looking access points. Plus I believe the routers have more features than the repeater access points anyways. My set up is working like a charm now that stupidity has not prevailed. Here's a rough diagram of my layout. I know it's a different system (Deco 5) but the concepts should be similar. My set up is going to be similar to your Deco set up, except I only have one AP instead of 2. I'll have a ton of IOT things plugged into a switch at one of the AP instead of a desktop and printer. EDIT: Random musing... something truly bizarre happening. Fast.com isn't showing good results. I've been getting 14-26 on fast.com but 114/15 on Ookla (Same computer). I am quite sure the DL speeds are closer to Ookla than Fast.com. I wonder why there is such a huge difference in tested speeds lately. Last edited by DoubleF; 01-31-2019 at 07:21 PM. Woob has the setup correct. The switch has to go after the parent node for the system to work. I have a question about wifi and I'm not sure if it's my Ubiquiti AmpliFi set up or something else. The Amplifi routers currently broadcast two wifi SSID. One is essentially DoubleF and the second is DoubleF-5g. DoubleF-5g will on occasion disappear from being broad casted, but DoubleF remains. When only DoubleF remains, I am still getting 5G speeds. Did I mess up a setting on the router? Is the -5g SSID being pulled into the regular SSID to avoid a double NAT issue? I'm not sure what to look up in terms of figuring out what the problem is. Go into your config and rename them to be the same SSID, there's no need to split them out. Your devices will simply connect on whichever band is available and stronger. So interesting tidbit to share about my Orbi, the RBK 50 which is the fastest one they have. It comes with a main unit and a satellite unit. It dawned on me that I may never actually be connecting to the satellite unit, so I tested it out. Turns out that even in my new home which is almost 2400 sq feet, I never leave the main router. I tested it out as extreme as I could last night, I put my router in the basement where the smart panel is behind my water heater. This is facing the front of the house. So then I put the satellite top floor opposite end. 2 floors and across the house. Even then I was still on the router and not being handed off. So there's 2 things about it. 1) that's annoying. 2) it isn't a "problem" because I'm still getting full bars and 170+ up and down on my 150 plan. I feel like I overpaid for something the Archer C4000 could do for half the price. I get handed over on my Orbi when I'm upstairs. What version do you have? Are you wired or wireless backhaul? Also how are you checking? The app? So the initial SSID that's being broadcast is both 2.4 and 5.0 GHz? I guess that makes sense then that the additional SSID for 5.0 is redundant even though the name is the same. I'll go look into it and tweak it when I get home. The Amplifi has a setting called router steering which has you connect to the main router over handing off to the mesh points for whatever reason. I don't really get the reason for this feature, but it's there. I wonder if your Orbi has a type of router steering setting going on? I had mentioned this previously in the other thread that the orbi is not a mesh system and instead a satellite system. Handoff is less aggressive and only kicks in when needed which with a 150mb plan would probably be close to never unless your house was cement. Traditional mesh systems like the velop, deco, Lyra etc hand off based on signal strength where the orbi is considerably less agressive due to the main node being the powerhouse vs the satellite node. Like the other post my velop steers the traffic to the closest node about 9/10 times. When I had my orbi I had similar Behavior that you had. Wired backhaul. There's a slight delay when the handoff happens. I just check the satellite's connected devices via its web interface. I only get two bars of wireless strength upstairs if I don't have the satellite on. So as a follow-up, I went into the settings and carved the 24 Channel down to 25% power. After a day-and-a-half of monitoring my devices stay on the 5 almost all the time, in fact I can't remember or recall it not being there. More importantly I'm finally being handed off to a satellite and I'm maintaining perfect speed on the satellite on my second level. I was also a sort of annoying to find some important settings were off by default. Last edited by White Out 403; 03-02-2019 at 07:23 PM. The main unit is extremely powerful. It's the first wireless router I've ever had that I can put in the basement utility room and have a useful signal on the second floor (that is, without the satellite). I'm a snob. I want my 170 download everywhere, not just full bars. Very true. Also when the signal's weak dropouts and delays are far more common.